In this paper, the software platform CASPR-ROS is introduced to extend the author’s recently developed simulation platform CASPR. To the authors’ knowledge, no single software framework exists to implement different types of analyses onto different hardware platforms. This new platform therefore takes the advantages of CASPR, including its generalised CDPR model and library of different analysis tools, and combines them with the modular and flexible hardware interfacing of ROS. Using CASPR-ROS, hardware based experiments can be performed on arbitrarily CDPR types and structures, for a wide range of analyses, including kinematics, dynamics and control. The case studies demonstrate the potential to perform experiments on CDPRs, directly compare algorithms and conveniently add new models and analyses. 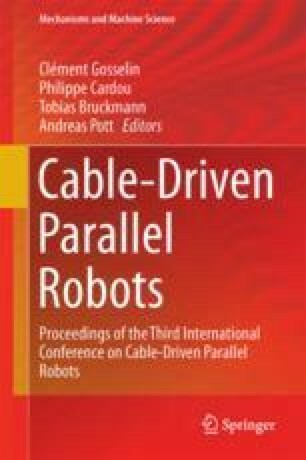 Two robots are considered, a spatial cable robot actuated by PoCaBot units and an anthropomorphic arm actuated by MYO-muscle units. The work was supported by a grant from the Germany/Hong Kong Joint Research Scheme sponsored by the Research Grants Council of Hong Kong and the German Academic Exchange Service of Germany (Reference No. G-CUHK410/16). Acknowledgements to the CUHK T-Stone Robotics Institute for supporting this work.